Sun rises through the trees in Siberia. Now it's my turn to write a post while Matt sleeps off his Siberian cold. I think it is a combination of the super dry hot nights (in hostel rooms, on trains), cigarette smoke that permeates everything, and new dust. Even I have a smoker's cough now and I've never smoked. Elektrozavodskaya station in the Moscow Metro. Transportation System. The transit systems here are pretty extensive, cheap and seem to be well-used. Some towns have a Metro, but all are covered by a combination of official busses, trams, trolleys and marshrutkas. These are privately owned "routed share taxis"that range in size from mini-vans to small busses. They may or may not have a ticket lady, and sometimes the driver is making change and handing out tickets with one hand while careening through traffic with the other. Our first experience with a marshrutka was in Nizhny Novgorod. We got on with everyone else, but made our way to front to pay then took our seats. We noticed the guy sitting next to us at the back of the bus (with spiked blond hair and acid washed jeans, carrying a hockey stick!) get our his money and pass it to the passenger in front of him. She passed to the man in front of her, and so on to the front of the bus where the passenger who happend to be sitting in front got the ticket and passed it back the same way. All of this was accomplished with the look of stoic indifference so many Russian have mastered. I can't even think of a instance in the US where that would fly. Fitting In. I really don't think we look Russia. The men are generally clean shaven, except for the priests, and the women are generally really well dressed. Regardless people are frequently asking us for directions. In general people ask each other directions a lot, so maybe it's just bound to be us once in a while. At least it's not the police asking to see our passports and finding a reason to fine us. Cyrillic. Now that we are able to sound out words in Cyrillic, I am struck by how many words are actually english. I guess in fact they are actually French, since, as I am learning from Tolstoy (yes, I am the dork reading War and Peace on the Trans-Siberian, at least it's on a kindle). French used to be the language used by the Russian upperclass. It does make life easier when you are reading a sign and realize it says tualet and does mean toilet. Siberian scenery taken from the train. Food. I think this was many people's biggest concern for us on this leg of the trip. Even the guide book said "say you're vegetarian early and often and get used to eating cucumber and tomato salad". In fact we haven't really had to say it at all as ingredients tend to be listed both on menus and in grocery stores, and we are getting good at recognizing the words to avoid. We are eating a lot of potato dishes, omelets and salads. A couple of times we have looked a plate only to realize we are essentially eating cabbage 3 different ways. I am a big fan of a cabbage and corn salad, and a beet salad in a creamy dressing. I have eaten some meat since it is harder to find potato or mushroom dumplings at a restaurant, and I love all dumplings. Even though Perm is the home of the Stroganovs I did not partake in their eponymous beef dish. 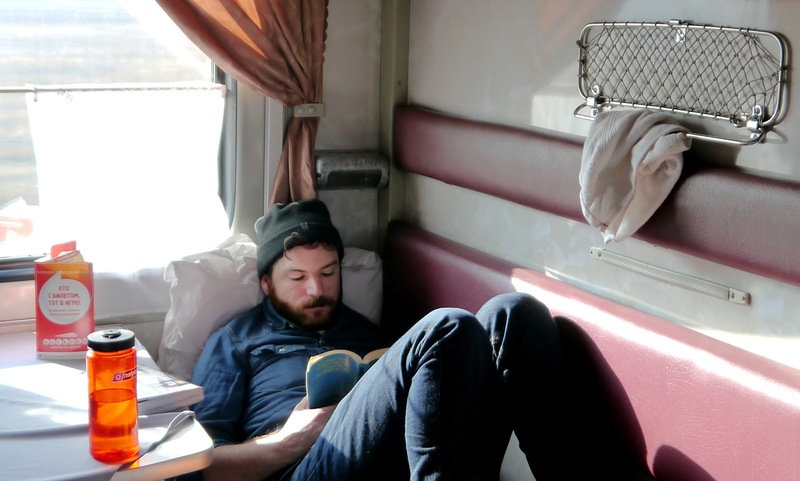 Matt reading on the train. Being tourists. 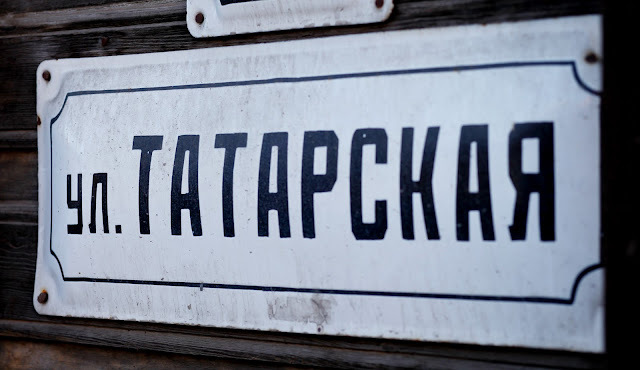 We have been make more stops that many Tran-Siberian tourists, many of them only make one stop between Moscow and Irkutsk, often Yekaterinburg (which we skipped). We have only met one single english speaking traveller, or anyone who looks touristy at all, since Moscow. The girl we met in a hostel was fluent in Russian and staying in the town for a while, not actually travelling. We have also only met a few people who speak broken English. I'm guessing when we get to Irkutsk we will meet up with all of the other backpackers.